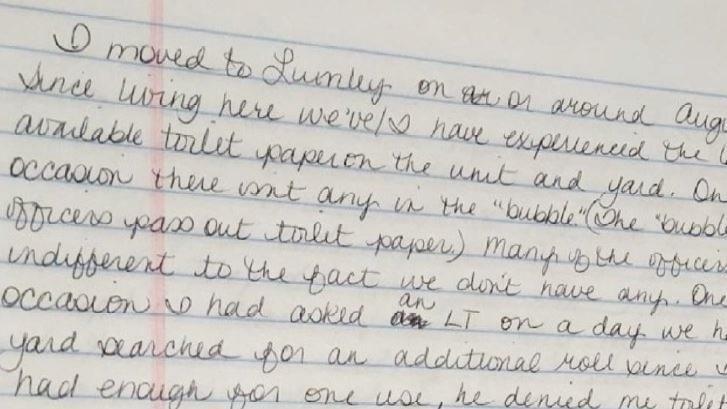 A letter from a female inmate at Perryville prison in Arizona indicating that toilet paper supplies are inadequate. 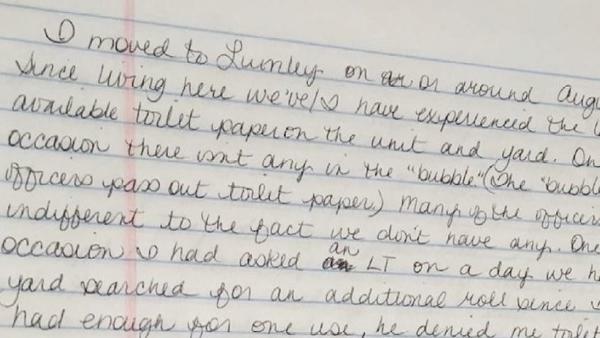 Letters recently sent from two female inmates at the Arizona State Prison Complex-Perryville describe their growing desperation as their basic hygienic supplies disappeared. "I ran out on Saturday 9/30," one wrote, "and although I continually asked for [toilet paper], was told they were out. They did have pads that I used as [toilet paper] until Monday 10/1 when they ran out. I then had to use a wash rag until Wed morn." Others pleaded for help through their families. They also asked prison staff. But, as another inmate wrote, "many of the officers are indifferent to the fact that we don't have any." The shortage of toilet paper, and prison officials' initial response to it, have outraged advocates and some lawmakers who question the competency — and decency — of the Arizona Department of Corrections, which oversees the state's prison system. "How do we expect folks to rehabilitate themselves, if we can't even treat them like human beings?" asked Joe Watson, a spokesman for the American Friends Service Committee in Tucson, a social justice advocacy group. "If you treat folks like animals, withholding their basic necessities," he said, "how do we expect them to come out of prison and feel like they are a part of their community?" More than 4,000 women are incarcerated at the Perryville prison in Goodyear, Ariz., the only women's prison in the state. According to a U.S. Department of Justice Bureau of Justice Statistics report from 2016, Arizona had the sixth-highest female incarceration rate of any state (106 per 100,000), almost twice the national state imprisonment rate for women. Still, part of the problem may be the fact that the system is dominated by men's prisons. It's "designed by men for men," said state Rep. Athena Salman, a Democrat. "Women have to use toilet paper every time they go to the bathroom," said Salman. "It's violating female dignity. Ask any woman what it feels like when she goes into a stall and there's no toilet paper." The shortage, however, is disputed by the Arizona Department of Corrections, whose spokesman, Andrew Wilder, said reports of shortages were "patently untrue." All inmates, he says, "have continuous access to toilet paper, at no cost to them." He admitted, however, that one of units in the women's prison did experience a shortage. He blamed it on inmates. "The unfortunate reality is that some inmates misuse the toilet paper or misrepresent themselves when asking for more," Wilder said. "And that can disrupt a unit's ability to maintain a reasonable and reliable supply for all of the inmates." He says a spot check showed some inmates had additional rolls. But it was unclear how many and for what purpose. On Oct. 10, the prison warden toured the unit with the inmates who complained. She declared the supply "good" and that "rolls are being provided as required," Wilder said. However, Salman says hygiene concerns have been a continuing problem. She has advocated for female inmates to have greater access to feminine hygiene products in prison. Those efforts led to a policy change guaranteeing more pads and tampons for the inmates. But she thinks more can be done. Salman talked to the governor's office about the recent toilet paper shortage. "They were aware of the situation," she said, with the office calling it an "unintended consequence of the director's order." That order from the Corrections Department, issued earlier this year, bumped up the allotment of toilet paper for inmates. It also tripled the costs for the department, to $48,000 from $16,000 per quarter. "Let's be real," she said. "This is one of the most well-funded agencies in the state. The Department of Corrections has a billion-dollar budget. How is it that they can't afford to meet the basic necessities of their inmates?" The fiscal year 2019 budget allocation from the state general fund for the Arizona Department of Corrections was $1,094,814,400. Salman thinks the only solution is to codify access to hygiene products in prison through legislation. Efforts to do this last session failed. She plans to try again when the Legislature begins. "It's frustrating to see that we have women inside our prisons risking retaliation to let the outside world know that they are going days without toilet paper," Salman said. "This is immoral and inhumane."